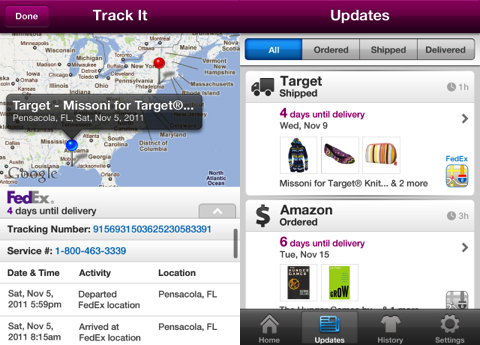 Slice is a free iPhone app that tracks your online purchases and shipping with minimal effort. You don’t have to fumble through your inbox or sift through a dozen emails from amazon.com. With just a few quick steps, you can track your purchases, shipping, returns, and budget, as well as access customer service representatives. Exactly how does the Slice iPhone app do it? You simply authorize Slice to access your email accounts. The home page opens with the opportunity to link your Google and Yahoo accounts, as well as sign in with your email. You enter your login and password, authorize the linked accounts, and Slice does the rest. If you want to add additional accounts, you can do so in the settings menu. That’s a great way to keep track of your household purchases. You could track your children’s iTunes purchases to monitor appropriate choices. You can track your husband’s account, so you can make sure you get exactly what you want for your birthday. In literally seconds, your purchases are loaded into your iPhone app. The home screen is visually interesting and highly functional. There is a great snapshot of your current orders’ statuses including how many orders are currently tracked; how many are being shipped; and how many will be delivered today. The snapshot also lets you know how many items you’ve purchased and how much you’ve spent. That’s a startling amount–particularly if you never, ever delete anything. Perhaps, it’s time to delete the Pizza Hut orders from 2010 for a less painful reminder. With one touch on any of the items on the home screen, you can uncover the details of your current orders or check out your expenses. There is also a menu to navigate through Slice at the bottom of the screen. The updates icon opens a great, concise list interface. The company is listed, as well as a synopsis of the order’s shipping status, shipping provider, elapsed time since purchase, and pictures of items purchased. The updates screen can also be sorted in one touch via a menu bar at the top of the screen. The categories are ordered, shipped, and delivered. When you touch an online purchase on the list, Slice provides an interface that is equal to three or four emails in just a couple of simple touches. All of the pertinent details like order date, order number, type of shipping, total spent, delivery date, product photos, and the customer service number are available. If you want a copy of your order receipt or a copy of your shipping receipt, you touch the bottom of the screen and Slice pulls up the email from your inbox. If you want to check out the return policy, Slice gives it to you with one touch. You can call customer service from within the app. Slice’s iPhone app truly makes life easier. If you like to maintain a budget for your online expenses, then you can monitor your history. From the home screen in the total spent area or via the history icon, you can check out how much you’ve spent for specific time frames. Slice has several default time periods like last month, last six months, or last year. You also can customize for a specific period with a calendar function similar to those used for airline ticket purchases. You can also filter your purchases by merchants, so you can check out which company takes most of your paycheck. Through this interface as well, you can search for specific items. Again, there is a lot of function, but it is simple and easy. 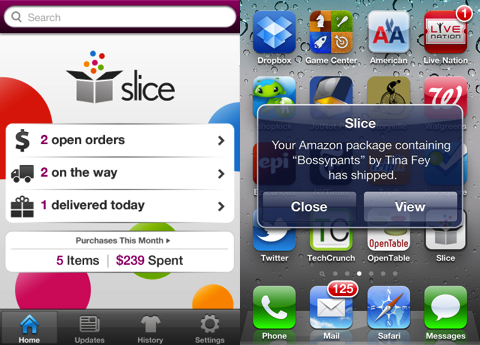 Slice’s iPhone app streamlines and simplifies your inbox and your life. And, as a bonus, it helps you bribe a friend to rescue your latest Apple Store purchase from a leaky awning, while you’re stuck in another boring meeting at the office. AppSafari review of Slice – Track, Organize Purchases was written by Jenni Ward on March 19th, 2012 and categorized under App Store, Featured, Free, Productivity, Reference, Shopping. Page viewed 4000 times, 1 so far today. Need help on using these apps? Please read the Help Page.